Earlier this year HTC started showing ads in the BlinkFeed screen in its devices, and people were not happy. 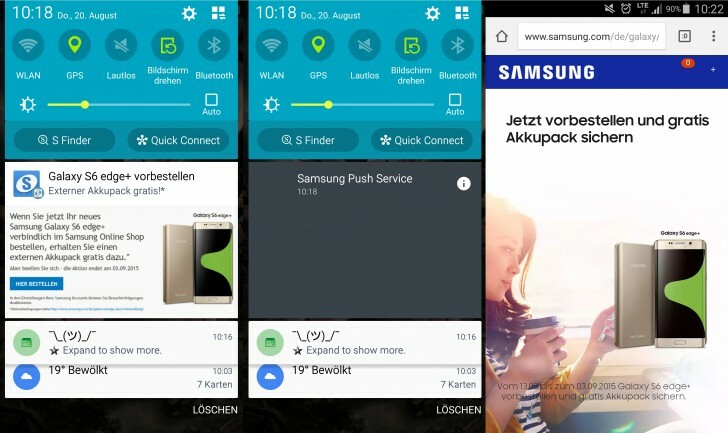 So we assume that people won't be happy this time around either, since Samsung has apparently decided that showing people ads in their devices' notification panes is a good idea. The ads show up "automagically" and they look like auto-expanded notifications. They are sent out by the Samsung Push Service app, which is one of those Samsung services that come preinstalled on all of the company's smartphones. For now, the only such ad spotted by users has been the one you can see above, which is for the Galaxy S6 edge+ handset. You're being announced that the S6 edge+ is now available to buy, and if you tap on the notification you're taken to a website where you can actually order one. This may of course be just a test or a limited rollout for now, but if so Samsung could have made it opt-in. As it is, you might just wake up one day to see your phone's notification pane overrun with ads. And that would not be a nice sight. In somewhat related news, the Peel Smart Remote app, which comes bundled on the Galaxy S6, has also started showing some notification ads of its own. It's unclear if Samsung itself has anything to do with this, though. Currently these ads are for TV shows, and when you tap on the notification the Peel app opens and you can set a reminder to watch that particular show. well played trolling. how can someone pirate chrome when its already free? Do something else, as trolling is not good.